While it’s not technically located within the Seattle city limits, May Kitchen + Bar is worthy of the title best Thai food in Seattle. It’s totally worth the drive and ferry ride to Vashon Island. 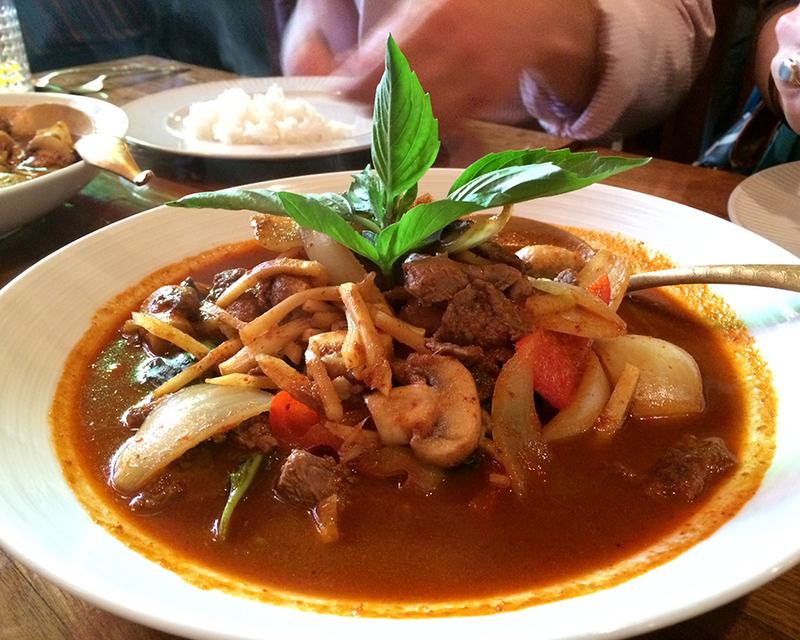 Just to clarify — I’m not joking — the best Thai food in Seattle is served on Vashon Island. This small restaurant is named after founder, owner, and chef May Chaleoy. Not only is she the nicest lady, she’s also one heck of a cook. 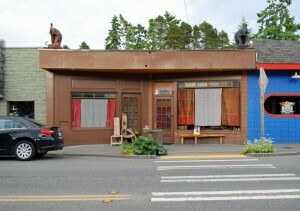 Tim and I haven’t spent much time on Vashon Island, but that will be changing now that we’ve discovered May Kitchen + Bar. Vashon Island is not very far from Seattle and it’s very charming. From the Fauntleroy ferry dock (located in West Seattle, near Lincoln Park), the ride to the island is just 20 minutes. Ferry departures vary throughout the year, so make sure you check the schedule online. Our friend Kaarin, who met us for dinner, lives in Tacoma and took the ferry to Vashon Island from Point Defiance (the schedule is here). You can also take a water taxi from downtown Seattle to Vashon Island during the week. This is a great option for people who like to ride their bike. It’s about five miles from the ferry terminal to May Kitchen + Bar. It may be a little bit too far to walk, but it’s a perfect bike ride. This is exactly what our other friend Andrew did when he met us at May Kitchen + Bar. Andrew claims Vashon Island is one of the best places to ride a bike and we’ll take his word for it. 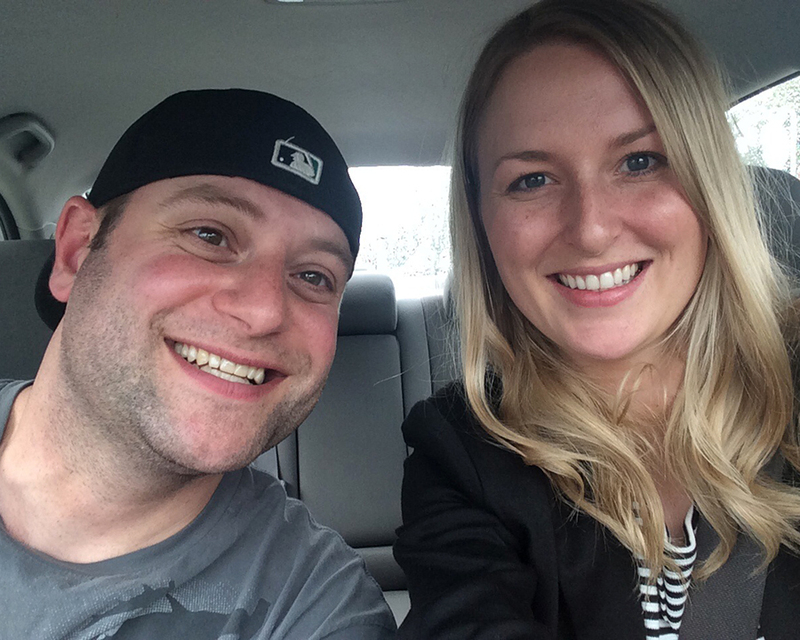 We all found May Kitchen + Bar was the perfect meeting place for a double date. Editor’s Note: If you travel to Vashon Island just to visit the restaurant, let the staff at May Kitchen + Bar know. They’ll give you a $10 ferry credit to help cover the travel costs. There aren’t many good words to adequately describe May Kitchen + Bar. It is truly a unique and fun experience. Chef May grew up in Bangkok, but learned how to cook when visiting her grandparents in the Thai countryside. That’s why a lot of the dishes you find on the menu aren’t typical dishes found in urban cities of Thailand. But this is still authentic Thai food at its best. We started our meal off with papia phak sot. 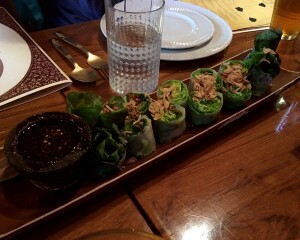 They are fresh vegetables rolled in rice paper wraps (aka spring rolls) with sweet tamarind sauce and fresh Thai chili. May makes it all from scratch, including the chili. Our next bite came as a bit of a surprise. 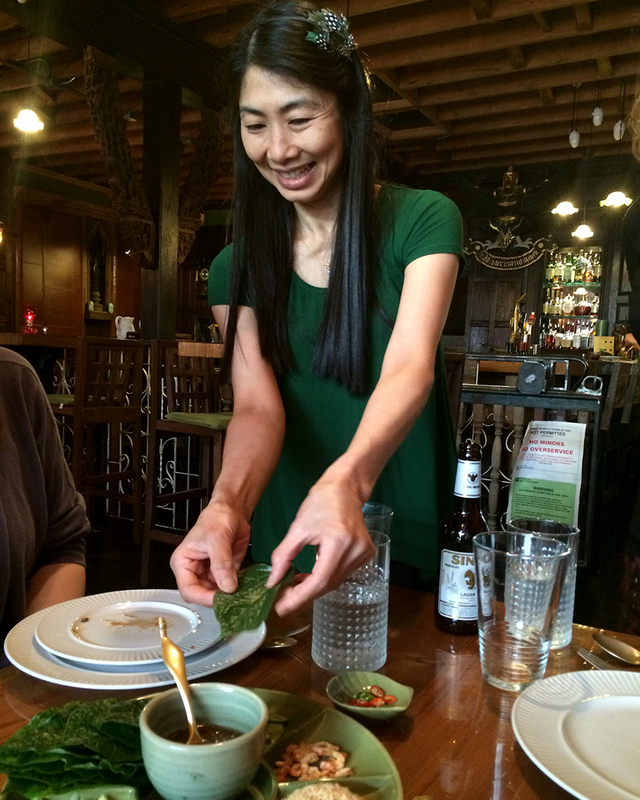 May herself brought out a special appetizer for us called miang kham. We learned that it’s a traditional Thai snack and can be translated to mean ‘eating many things in one bite.’ May showed us how to fill a Piper sarmentosum leaf (it looks like a giant basil leaf) with an assortment of small food items including shaved coconut, peanuts, ginger, garlic, dried shrimp, chili, and a sauce. Once filled, May instructed us to eat it all in one bite. It was a powerful bite filled with lots of flavor and spice. May Kitchen + Bar only serves miang kham on Sundays, however, this summer it will be available every night. After some recommendations from our waitress, we decided to order four dishes and serve them family style between the four of us. Our first selection was phad Thai. While this is a staple dish for many of people who go to Thai restaurants, this is not a typical phad Thai. The steamy and moist noodles came wrapped in a banana leaf. 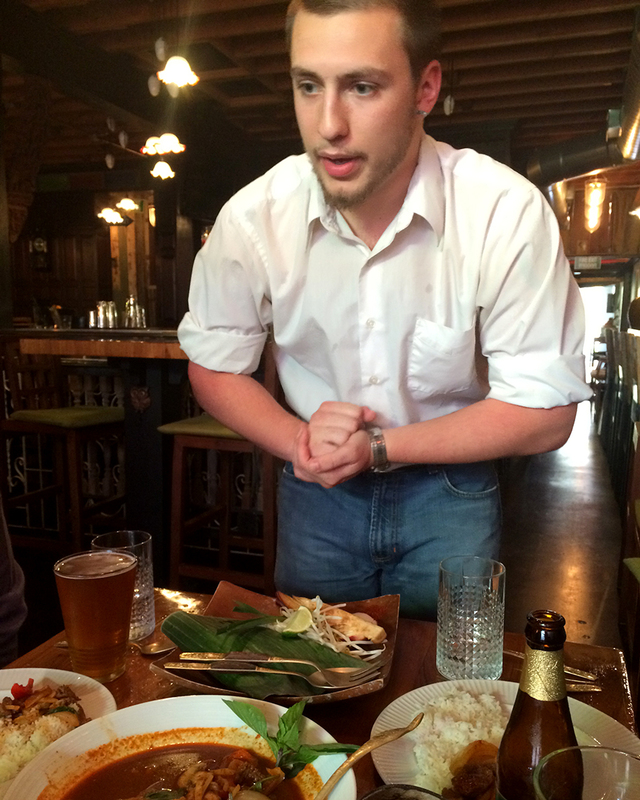 One of the servers unwrapped the banana leaf and added ingredients one-by-one at our table. It was super neat, and really tasty. We also ordered gaeng khiao waan, which is green curry. May makes her own green curry paste from scratch. It was easily the best curry I’ve ever had, and the best dish of the night. May also makes her own red curry paste, and she told us she plans to start making her own yellow curry paste in the near future. Next, we had the phad metmamuanghimmaphan (yes, that is the actual name of the dish) which is May’s take on a cashew dish, and phad prik khing which is a spicy stir fry of green beans in chili and ginger, with your choice of meat. We devoured it all. We topped off our meal on a sweet note with fried bananas, which came covered in coconut flakes, drizzled in honey, and served with Thai coconut ice cream. We definitely didn’t need to eat dessert (because our bellies were full), but we couldn’t pass it up. Editor’s Note: There is a good chance you’ve heard about May before. She use to have a restaurant called May Restaurant and Lounge in Wallingford. That place is still around, but May is no longer an owner or chef there. Besides the awesome food and incredible owner/chef May, there are a few other things to share about May Kitchen + Bar. Don’t be fooled when you see the restaurant for the first time. When we visited, the windows were lined with closed curtains and it looked pretty quiet. I was actually nervous that it might be closed. Once we opened the door, it was a completely different story. The walls are lined from floor to ceiling with beautiful 150-year-old teak wood from Thailand. May has left small decorative details throughout the space, including a large portrait of Thailand’s famous King Rama V. It is so beautiful! The waitstaff is also incredibly welcoming. In fact, it was the very first thing we commented on when we were seated by the hostess. Our waitress told us that their motto is hospitality from the heart, and that is exactly what we got. We felt like we were treated like family from start to finish. 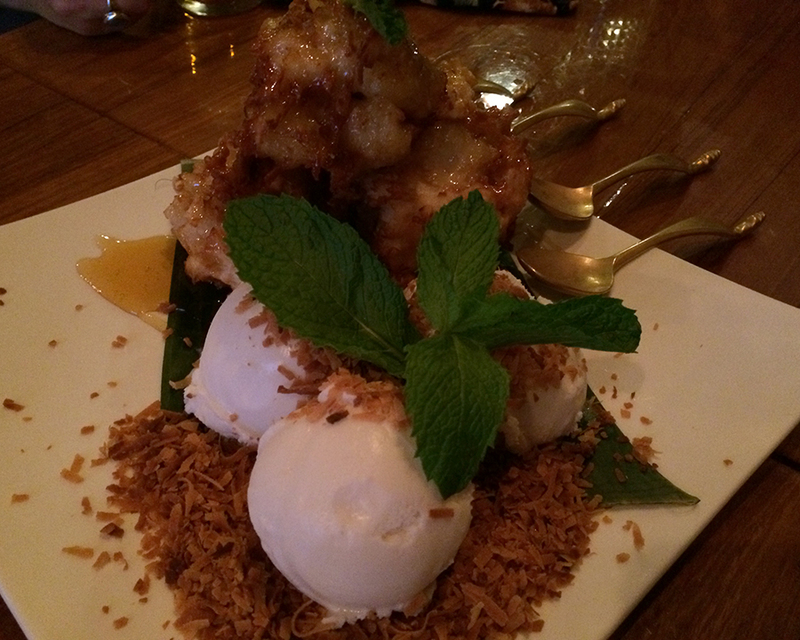 We will admit that the food is a little pricey compared to other Thai restaurants. But, it was also a whole lot better than other Thai restaurants. From the beautiful decor, to the heartfelt service,and the made-from-scratch food, our experience at May Kitchen + Bar was seriously awesome. We’re already making plans to go again soon. 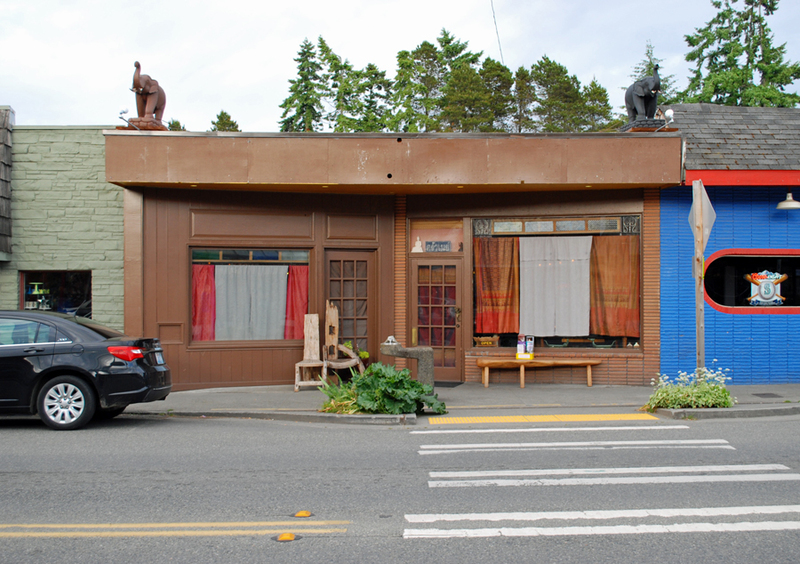 Have you ever visited Vashon Island and dined at May Kitchen + Bar? Did you have just as great of an experience as we did? We’d love to hear from you! Please leave a comment below or connect with us on Twitter, Facebook and Google+. 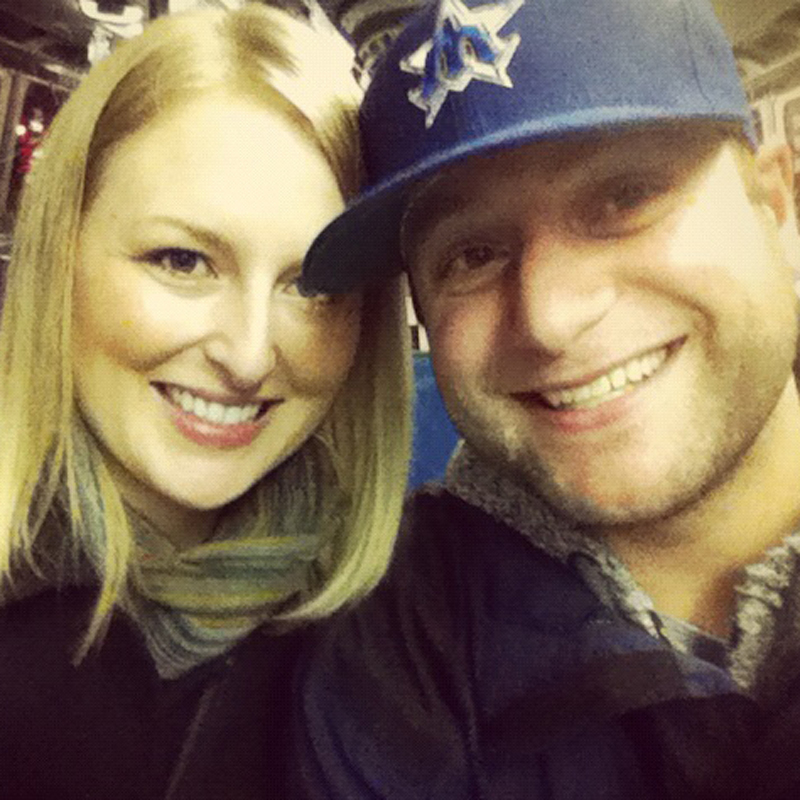 Don’t forget to also check out Seattle Bloggers for more great places to eat, drink and be merry in the Emerald City! Mmmmmmm, I get hungry again just thinking about it! Such a great post. You are right, words can’t do it justice… but yours came close! Thanks for the fun double date! I live on Vashon Island, and May Kitchen is great! 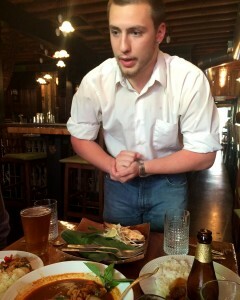 I don’t know much about Thai food, and I have to ask a lot of questions, but they are patient, and the food is great! I love the rice too! We LOVE May Kitchen!! We go there as often as we can and we have never had a bad experience. The food is always fresh & delicious, the hostess & waitstaff are incredible and the drinks are amazing!! Gorgeous atmosphere. Feels like you have been transported to a paradise far away. Seriously can not say enough about this fantastic place! We live on Vashon and we LOVE, LOVE, LOVE May Kitchen. We go a couple of times a month and have never had a bad experience. The food is amazing and the staff is stellar. We feel like family from the moment we walk in the door. I always take a moment to go back to the open side of the kitchen and say hello to May. She’s such a sweetheart, as well as an amazing chef.